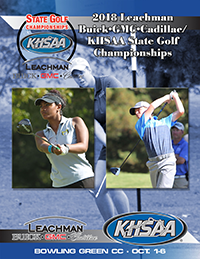 The mandatory Online KHSAA Rules Clinic for the sport of Golf is available beginning August 1. The clinic is required for all head and assistant coaches. August 1 to August 15 – the Golf Clinic will be online only and may be viewed at no charge during this period. August 16 to September 11 – the Golf Clinic will be online only and may be viewed for the makeup fee ($100) during this period. September 12 to September 25 – the Golf Clinic will be online only and may be viewed for the makeup fee ($200) per the Bylaw 27 schedule during this period. After this time, postseason penalties per Bylaw 27 will apply. You must complete the clinic at one setting. Individuals starting and not completing will have the start of the clinic erased and will have to begin at the start when resuming. Each person who views the clinic must be logged into their account in order to get credit. If taken using an e-mail address other than your own (including your administrator’s), you will have to re-take the clinic.